Did you ever try tickling yourself to see if it makes you laugh? Do you know it’s impossible to tickle yourself? But!! If you just tickled yourself out of curiosity and it did make you laugh, then my friend it’s time for you to see a psychiatrist, because we can’t tickle ourselves, it’s just impossible!! You may be scared to know this, but studies have now proved that self-tickling is linked to schizophrenia. But those who can may be suffering from symptoms of schizophrenia!!! Scared, well after you finish tickling yourself one more time since you want to be sure, do read on, to know how a scientific study has verified such claims. It is a scientifically proven fact that tickling yourself is virtually impossible. However explanations to that effect have never really been provided generally and its one mystery that is yet to be understood. The ability to tickle oneself, to go into throes of laughter isn’t funny at all. The action is linked to an underlying mental disease and warrants an immediate visit to a doctor. An in-depth study way back in 2000 discovered the unseeingly possibilities of the presence of mental disorders with the ability to tickle oneself. The study concluded that only those with some levels of schizophrenic behavior had the ability to tickle themselves while normal people could not. The lead researcher of the study in 2000, Neuroscientist, Sarah Jayne Blakemore published her discoveries of how schizophrenic people defied the mystery of one’s inability to tickle oneself. Blakemore’s study revealed that the brains of schizophrenics’ did not have the ability to obstruct the consequences of a self-action. This could also be the prime reason for hallucinations and paranoia. Cut to the present day and taking the study forward are psychologists from France, who have acted upon Blakemore’s theories to find evidence supporting her claims that self-tickling is linked to schizophrenia. This is what they found!! Led by Anne Laure Lemaitre, the team of psychologists provided participants with a schizotyopal personality disorder test to find out symptoms linked to personality disorders. If you want to take this test out of curiosity then click here. Lemaitre’s team’s experiments were successful in proving Blakemore’s study and published the findings in the April 2016 issue of the Journal of Consciousness and Cognition. The experiments involved 397 students, who were divided into two groups. None of these volunteers had ever been diagnosed with any mental or personality disorders. All of them took a Schizotypal Personality Questionnaire, which included questions on things like strange perceptual experiences and unusual beliefs. After that, they also completed a questionnaire which was basically about how they experienced the feelings of passivity. Two batches were then selected, based on high or low results. Thus 27 with high scores were selected and 27 with the lowest scores. All these would be then tested for self-tickling. Seems a fun test but the results are scary too. Could you be a schizophrenic? Take further tests on the page and find out if you’re a psychopath too! The subjects were made to tickle themselves with a brush. They were also tickled by the researchers. The subjects were then asked to describe how intense was the tickling by the researcher and by themselves. All of the students felt more or less, the same when tickled by a researcher. BUT!! 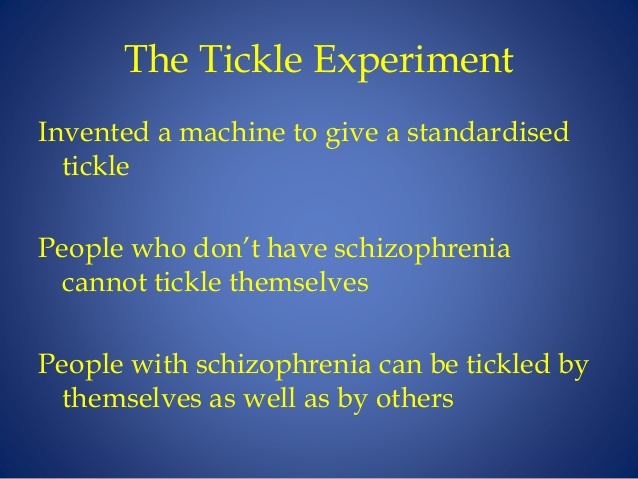 Only those with schizotypic results claimed they felt more ticklish when they tickled themselves! 5 Are You Self-Ticklish??? Hope Not!! While Lemaitre was thrilled about the fact that the experiment was a success and came out with a conclusive proof, those who were self-ticklish were certainly not. After all how many schizophrenics or those with personality disorders ever own up to it. However, the test was a limited one and could also indicate that healthy people who tend to have a sense of higher perception and people who may have experienced higher perceptual incidents like paranormal or passive experiences may be self-ticklish to a certain level. 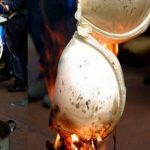 The findings definitely don’t say that you will be developing schizophrenia, but the results are consistent with the idea that the brain processes that contribute to the symptoms basically experienced by patients with schizophrenia, may also contribute to the occurrence of schizophrenia-like symptoms among healthy people. Regardless of the debate, it has been proved that self-tickling is linked to schizophrenia. Why Do We Kiss With Our Eyes Closed?